This dish has multiple personalities. It can be as soothing and comforting as a warm blanket when it’s cold outside or it can be upscale and refined. It can even be a perfect prelude to a bigger meal. Let me show you how. Picture a gray day. Maybe some drizzly rain. The kind of weather where you just want to curl up on the couch and watch a Game of Thrones marathon. You want something warm and creamy. Soup — maybe with a grilled cheese sandwich for dunking. This fits the bill. Heat up the soup, toss in the croutons and voila! Now imagine a different scene – a cocktail party. Gentlemen dressed in sport coats, ladies in heels and dresses, sipping libations, having lively conversations, tapping to a festive beat. 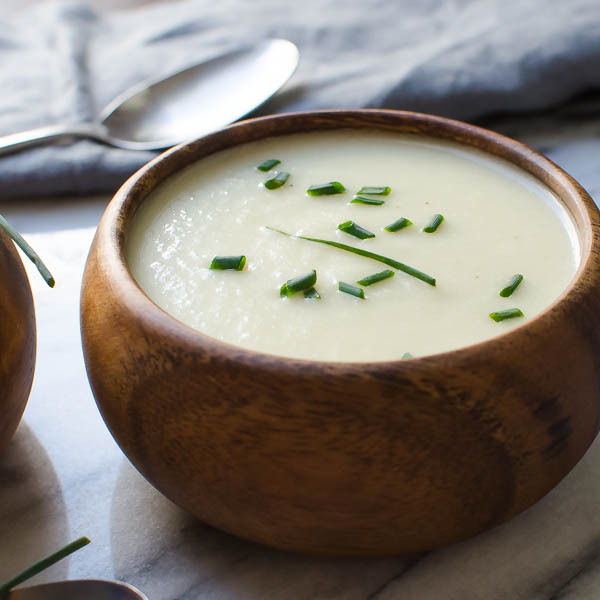 One of the hors d’oeuvres you’re serving is presented in little demitasse cups filled with chilled pepper soup, a drizzle of tarragon oil and crispy croutons. Elegant? Yes. Different? You bet. Last scenario – a sit down dinner party. You have the wine. You’ve made a nice main course and purchased a lovely tart for dessert. You want a starter that won’t ruin your guests appetite for the rest of the meal. This is it. A beautiful dish that revs up their taste buds for your main course. Serve it hot or cold – whichever you prefer – drizzle each bowl with a little tarragon oil, drops of cream and maybe a flourish of chives. Pass the croutons! 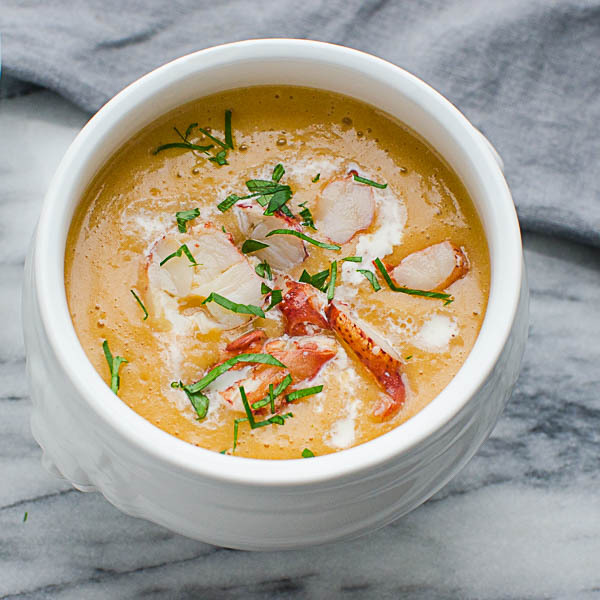 This versatile soup comes together in a snap and is perfect served chilled or hot. Make it vegetarian by using vegetable broth instead of chicken. For Soup: Preheat your grill to about 400 degrees (see note below). Place whole peppers on the grill, turning occasionally, until skin is blackened and flesh is soft. While still hot, place peppers in a large brown paper bag and roll up to close the bag. Let the peppers steam in the bag for 15 minutes or so until they are cool enough to handle. Remove from bag. With your fingers, peel the skin from the peppers. Cut the peppers in half and remove the seeds and the stem. Put the peppers in the blender. Add chicken broth. Secure the lid and puree until smooth. Add the cream and salt to puree and blend. Taste for seasoning -- add more salt if needed. For breadcrumbs: Preheat oven to 300 degrees. On a sheet pan toss bread crumbs with olive oil, sprinkle with salt and pepper. Toss again. Bake for 15 minutes or until crunchy and golden brown. Set aside. For tarragon oil: Place tarragon leaves and olive oil in a mini-prep food processor or blender. process until very smooth. Place a fine-mesh sieve over a small bowl and pour the tarragon oil into it. Strain the oil from the solids. Set aside. Soup can be served hot or chilled. Tip: I grilled my peppers until they were charred black on the outside, but if you don't have a grill -- or it's too cold to go outside where you are, put them in a 400 degree oven for 20-30 minutes, until skin is blackened and flesh is soft. Tip 2: the garnishes are optional, but they are easy to make and add new dimensions to the dish. Other optional garnishes - freshly grated parmesan, grilled cheese croutons, chopped hard-boiled egg. Also, if you don't have tarragon, you can use basil, parsley or cilantro instead. I am in love with the idea of the soup in demitasse cups for a formal cocktail party! What a great presentation, especially with the gorgeous, vibrant color of the soup. Blistered peppers have such great flavor, and paired with the cream, tarragon oil, and of course, croutons, this must be a showstopper dish.